We found Five 7 years ago at a local animal shelter. She was approximately 2 years old when we got her. It wasn't a love connection at first. We didn't realize what a little "Monster" (her earned nickname) she would be. Once we had her at home, we found out she did not want to be held nor pet. Her main goal was to terrorize our other cat throughout her life. We named her Five for the number "5" on her side. She hated high pitched noise, and she would run around yelling if she heard silverware or dishes clank. She loved looking for outdoor cats through the window. All we would have to say is "LOOK! KITTY!" and she'd go running window to window. She loved her blankets, her tunnel, her laser light, and exploring nooks and crannies. She was so photogenic that we have hundreds of beautiful pictures of her. We grew to love her very much. She eventually let us scratch her face but we knew our place as her servants. She passed away in March of 2015 of lung disease. She taught us to love unconditionally. We will miss her always. 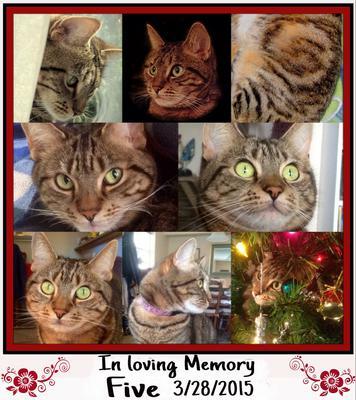 She sounded like an ornery but sweet cat sorry for your loss. So very sad to loose 2 in a short time; love sent.